Week 78 - The Vision-net.ie Q1 Review... ...has arrived! The Vision-net.ie Q1 Review... ...has arrived! 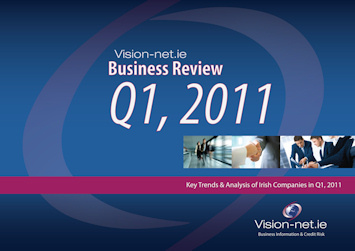 The Vision-net.ie Business Barometer has compiled and evaluated all of the latest Official filings with the CRO as well as the Published Notices in the National Newspapers to provide you with the FULL PICTURE on Start-Ups, Insolvencies, Liquidations etc for the First Quarter of 2011. Vision-net.ie aims to provide the most up-to-date, comprehensive and above all, reliable information in the market. We've put all of our expertise into the Quarter 1 - 2011 Review and we hope that you find it to be an insightful read.